Thank you for choosing to spend your vacation with us at Great River Houseboats. We know you have many options when deciding how to spend your leisure time, and we’re glad you are here! Located in the most scenic part of the Mississipi River, we now offer a more wild experience. See a part of the River that can only be experienced by boat. Enjoy a summer vacation with your whole family for a great price. 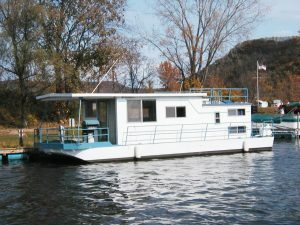 This is a unique Houseboat vacation located in the heart of the Mississippi River between Minnesota and Wisconsin in Alma, WI. Experience the beauty and serenity of the Mississippi River valley on board a floating lodge. Picture sandy beaches, charming river towns, breathtaking sunsets and majestic bald eagles soaring overhead. On a houseboat rental from Great River Houseboats, with no experience, you can be your own riverboat captain and chart your own course. There are no schedules to follow and no meetings to attend. Adventure, excitement or relaxation, it’s all up to you! 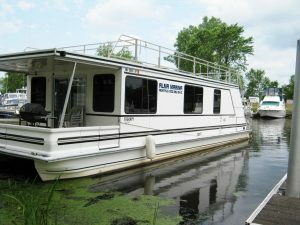 When you book a vacation with Great River Houseboats at Alma Marina you will be treated like family. The knowledgeable Great River Houseboats crew will be there to answer all your questions and make your Houseboat rental fun and exciting. They will even take you on a practice cruise to help you become familiar with the simple houseboat controls and make sure that you will feel comfortable and confident in navigating the river. From the hustle and bustle to the peaceful movement of the water….your adventure will take you to places that will stay in your heart and mind forever! Great River Houseboats home port is out of the Alma Marina in Alma, Wisconsin. Alma is located on Pool #4 of the Mississippi River. Pool #4 is one of the most beautiful pools of the entire Mississippi River. Plentiful beaches line this area of the Mississippi River. Besides Alma, cities on Pool #4 are Wabasha, MN (Home of “Grumpy Old Men”) Lake City and Red Wing, MN, and Pepin, WI. Lake Pepin is also part of this pool. Come join us and experience life on the Mississippi River in one of our rental houseboats! We even have combo houseboat rental packages that offer a floating home away from home while you navigate and explore the river. Spend the day on the water and when available return to the marina an hour before nightfall and stay in air conditioned comfort. Prior arrangements must be made with the reservation staff.